US Road Trip Day 2 aka Yellowstone & the Road to Hell | Where's my backpack? I woke up from a deep sleep, not quite sure where I was. It took me a moment to realise I was in a motel off I-90 just across the Montana border. Memories of the previous day’s adventures came flooding back as my gaze settled upon the clock on the night stand. It was too late for the continental breakfast of soggy croissants and stale coffee that was standard motel fare. I took consolation in the fact that at least I’d woken up before my friend, and Sprocket was still sleeping happily, his paws twitching as he chased after some imaginary animal in his dreams. Soon we were up and running, grabbing a quick bite and some proper coffee at a local restaurant and then we were back on the road. 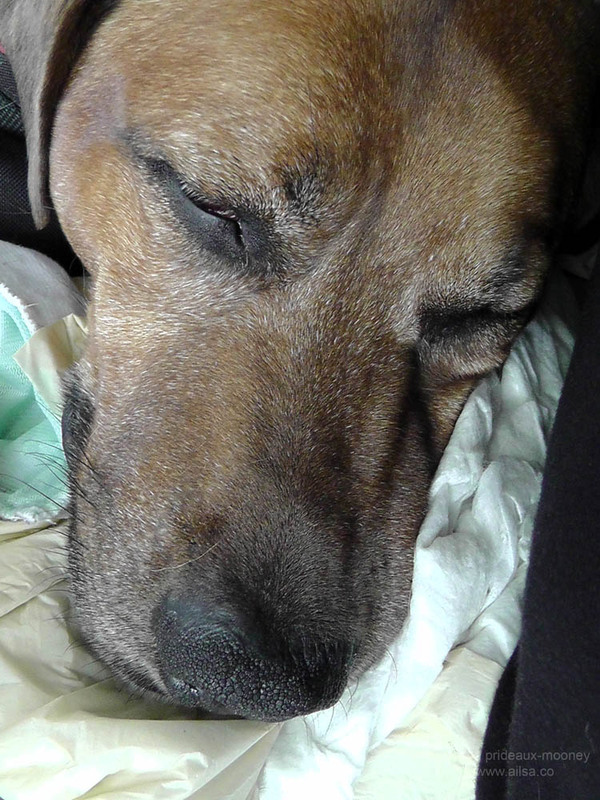 Sprocket hopped happily into his crate in the back seat without hesitation and with almost no sign of drool. We praised him for his remarkable bravery and rewarded him with kisses on the top of his head. Things were looking up. Montana’s endless blue skies spread out before us as we drove east along I-90. I’ve heard the monicker ‘Big Sky Country’ many times before, but never truly understood the truth behind the name. This state is the jewel in the crown of US landscapes; its beauty is beyond belief. I lost count of the number of times we caught our breath as we crested another hill and the sky exploded into view. Just before Bozeman we turned off I-90 and headed south towards Wyoming and West Yellowstone. A road trip wouldn’t be complete without at least a quick jaunt through Yellowstone Park. I’ve wanted to see Yellowstone for as long as I can remember, and although we couldn’t linger long there, my friend wanted to show me at least a little corner of its beauty. After a quick stop for lunch and a walk for Sprocket, we entered the park via the west gate and headed east. Off to our left, a golden eagle gazed disdainfully at us as we ‘oohed’ and ‘aahed’. Sprocket was unimpressed, curling up in his crate and taking a nap. A little further along, a graceful elk was grazing by a river. We had a few moments of grace, admiring this noble creature with its velvet-covered antlers in blissful solitude, and keeping a distance large enough for this wonderful animal to happily ignore our presence, I got a few photos using a zoom. All too soon, however, a rowdy crowd of Yellowstone tourists gathered and the elk wisely chose to find another spot to graze. It always troubles me when I see people treating wild animals like a sideshow attraction, disturbing them in their natural habitat and allowing their children to get dangerously close. In our rush to dominate the planet we have left precious little of it for the animals. This is their land too. Show some respect. 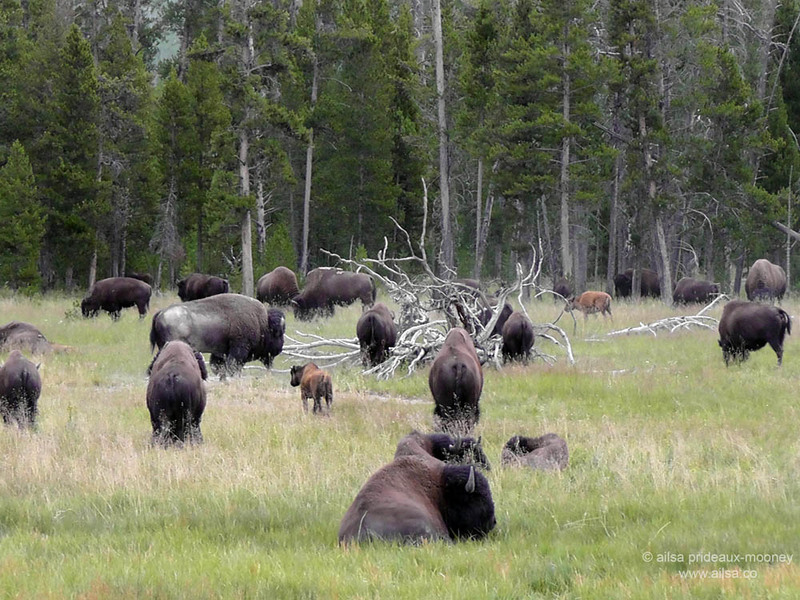 We headed towards the northwest exit along highway 212, stopping along the way to view a spectacular geyser of steaming turquoise waters and a herd of buffalo who were sprawled lazily in a meadow. There were other visitors to the park watching too, but thankfully they were rather better behaved than the people we’d encountered earlier. The daylight was fading fast so we pressed on, but couldn’t resist getting out at the top of a mountain to watch the sun set behind a thick mist and a startling blood red moon rise over the park. 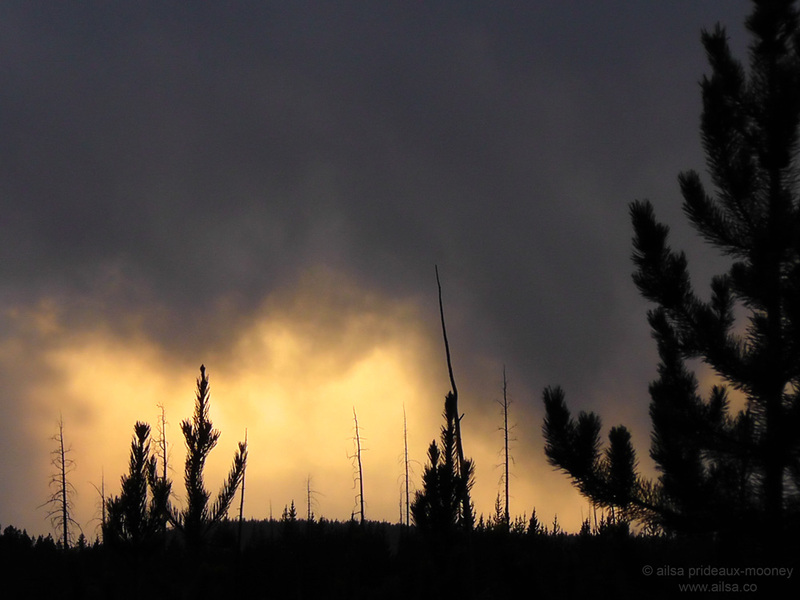 It was completely dark by the time we exited Yellowstone and found ourselves in the quirky little town of Cooke City. The fact that it has ‘city’ in its name is rather misleading, as it boasts a population of 140 and covers roughly ten square miles, but it packs so much neon into its main street that its aspiration to city stature is well-founded. After another walkie for Sprocket, we consulted our road map. The next city along Highway 212 was a place called Red Lodge, so we called ahead to book a motel for the night. It was about 65 miles away so we figured we’d be there within an hour, which was perfect. It had been a long day and we were ready for an early night, so we piled back into the car and set off along 212. And then things started to get very strange indeed. 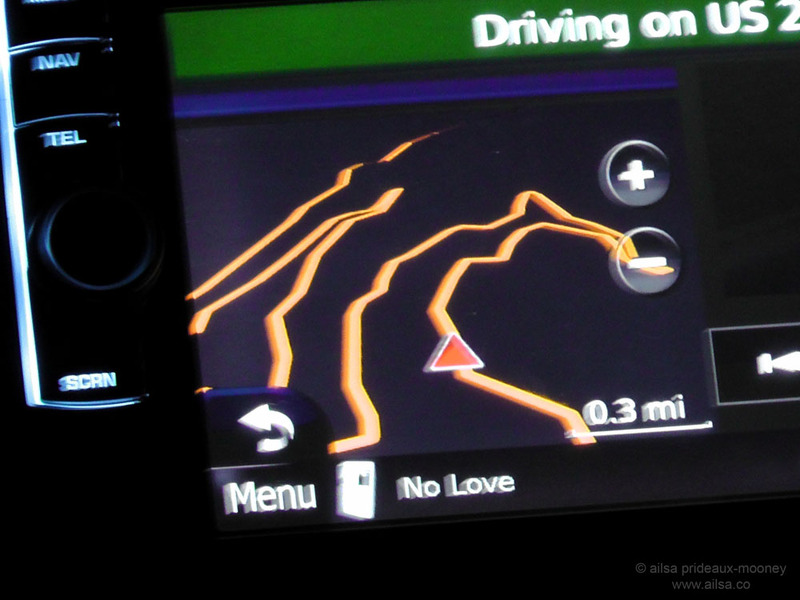 About fifteen miles out of Cooke City the GPS display started doing a dance. The bright orange glow indicating the road ahead turned from a straight line into a wave, and the road we were travelling along started to weave from left to right and up and down. Road signs dotted the way, warning of winding roads ahead, and then the GPS display erupted into a swirling tangle of orange that more resembled a plate of spaghetti than a road. We giggled nervously as my friend grasped the steering wheel and slowed down to a snail’s pace. We swung to the left, lurched up an incline, stuttered right, staggered up another incline. As more and more signs shouted ‘Curves up Ahead’ our giggles turned to groans. I was beginning to feel queasy and my friend was beginning to lose feeling in her hands. She was clutching the steering wheel so tightly I could see her knuckles had turned white. Poor Sprocket must be in hell, I thought to myself, and looked over to find him drool free and sound asleep. “Well, at least ONE of us isn’t drooling” I commented to my friend, and we erupted in gales of near-hysterical laughter. We rolled the windows down to sharpen our focus, and were assaulted by the unmistakable smell of snow. Exactly how high up were we? The road turned from curves to switchbacks to zigzags so abrupt we almost met ourselves on the way back, and we drove slower and slower, now aware that we were above the snow line and unwilling to plummet off a precipice and disappear into the abyss below. To add to our sense of impending doom, we passed a sign indicating that the white markers along the road were places where past travellers of Beartooth Highway had perished. Up until that point, we had assumed the markers which lined both sides of the road were there to keep vehicles on track, rather than a memory of those poor unfortunates who had gone perilously, mortally very far off track. You can say that again. We found out from a brochure in the lobby that the elevation of Beartooth Pass is 10,947 feet; no wonder we smelled snow. We also learned that Beartooth Highway is billed as one of the most beautiful drives in America… during daylight hours. Here’s a short video of our second day on the road. We staggered away from the reception desk, our eyes still bearing the traces of unadulterated terror. Sprocket gamboled along happily beside us, refreshed from his nap and ready for a walk before bedtime. By the time my head hit the pillow, I was asleep and dreaming of plunging off snow-capped mountains. This entry was posted in Montana, Photography, Travel, United Kingdom, Wyoming and tagged humor, photography, photos, pictures, postaday, travel, writing. Bookmark the permalink. Hahaha, you crack me up, pommepal. Oh boy!!! The horror of getting lost in the dark. 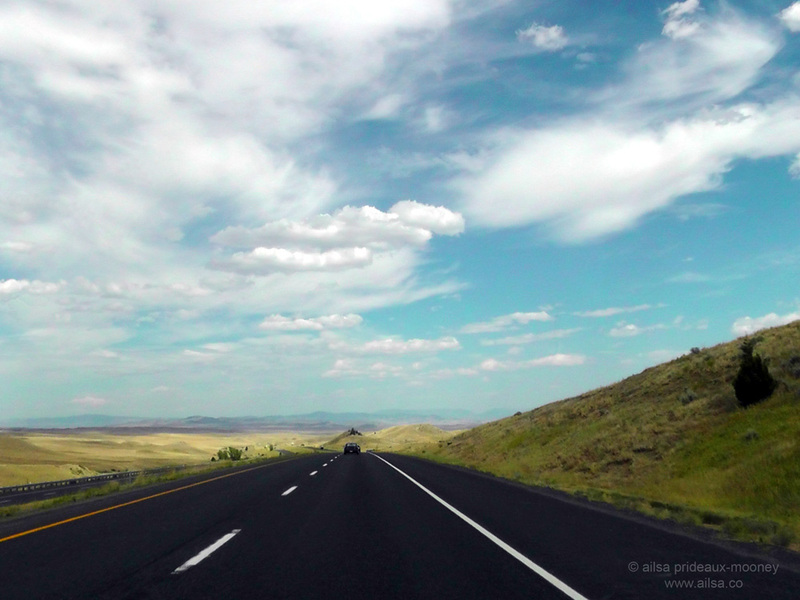 So pleased you survived that terrifying road to tell us the rest of the journey…. It´s great to get away and see things you don´t see every day, isn´t it Ailsa? 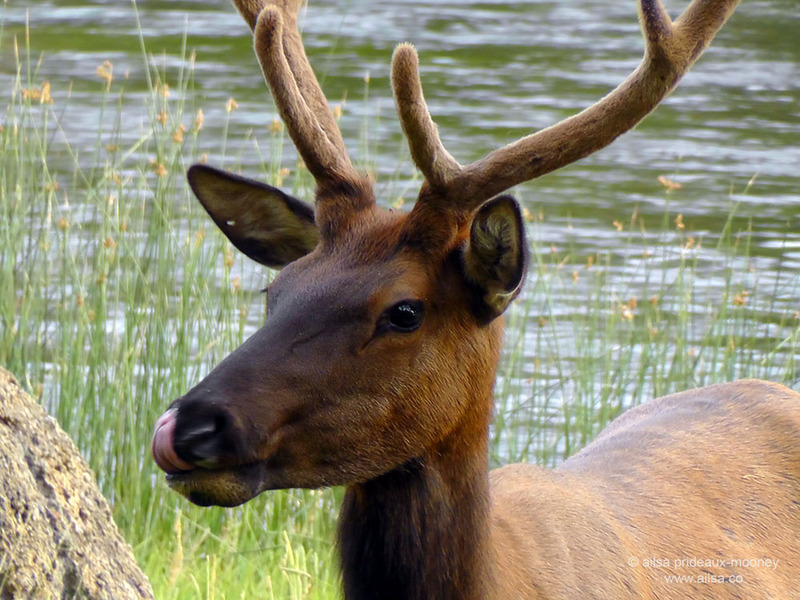 Love your close-up shots of the elk and buffalo. What great photos and terrific writing. You really made your journey come alive for me. I was with you on that winding road. Great stuff. So glad you enjoyed it, Suzanne, hope I didn’t make you too carsick with my winding road! Beartooth Pass… even the name sounds dangerous! You’re right, Gilly, it was a little like driving through a ghost forest. The moon was pretty spooky too. All in all, a hair-raising end to the day. Wow! What a road trip you are having!!! Your travel tales have me enthralled every time. I’m glad you made it safe and sound through Bear tooth pass. Once again it was like I was there with you – just wonder how you can see all those wonderful things while driving. Love the deer photos … Buffalo’s are magnificent – never seen one .. we only have normal cows over here … *smile. Sprocket’s photo is wonderful, wouldn’t believe that he doesn’t like to travel by car when looking at it. Thanks for an other stage of your journey. Maybe if it hadn’t been the road of/to hell, we wouldn’t got the chance to enjoy your photos. So happy you’re enjoying my posts, Viveka, those buffalo were amazing to see in the wild, and the adventure along Beartooth Highway made for a really great story.The way Sprocket got over his car-sickness has been amazing, he’s such a brave doggy! Sprocket – bet he are glad for being free from that awful feeling. What an adventure you are having. Your posts read like an exciting novel that you should put into print. I was gridding my teeth all the way through your winding journey. Glad you are safe. Looking forward to the next installment. I know, ad, I couldn’t believe how well my friend kept it together as we wound along that pass, she gets major brownie points for making it all the way to Red Lodge without stopping even once. Oh man! Nothing like hearing …I can’t believe you drove that in the dark…to freak you out even more. Glad you made it safe. The photos are gorgeous! Thanks Angelia, it was quite an adventure! Big sky country!? No lie! Grin, glad you enjoyed it Bob. Stunning pictures and lovely post. 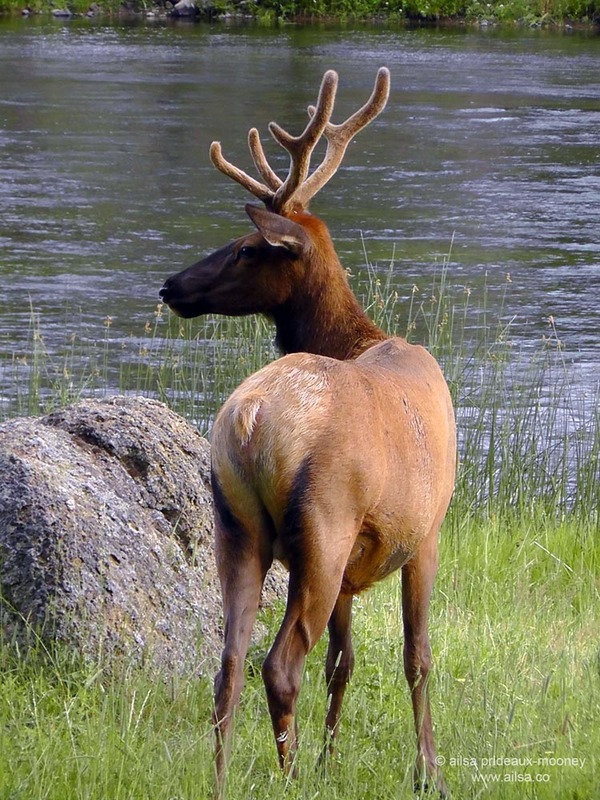 Great story – the photos of the elk are lovely. Glad to know you survived! 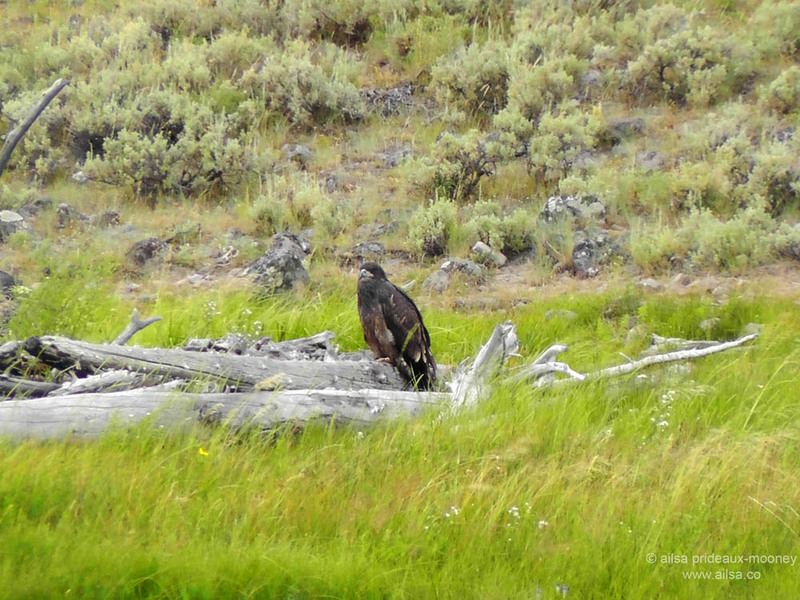 That elk was magnificent, gkm2011, I only wish we hadn’t been disturbed so soon, I could have watched for hours. Oh my gosh, the road from hell – and you missed all the scenery!! I’ve been that white knuckled driver myself but not on anything like that – in the dark! I know, Lynne, it makes me want to go back and see it in the daytime. I’ve done some white-knuckled drives in my time, but nothing like this! Another trip 🙂 what could be better? Oh good heavens! You poor things! The elk is gorgeous as are the bison! 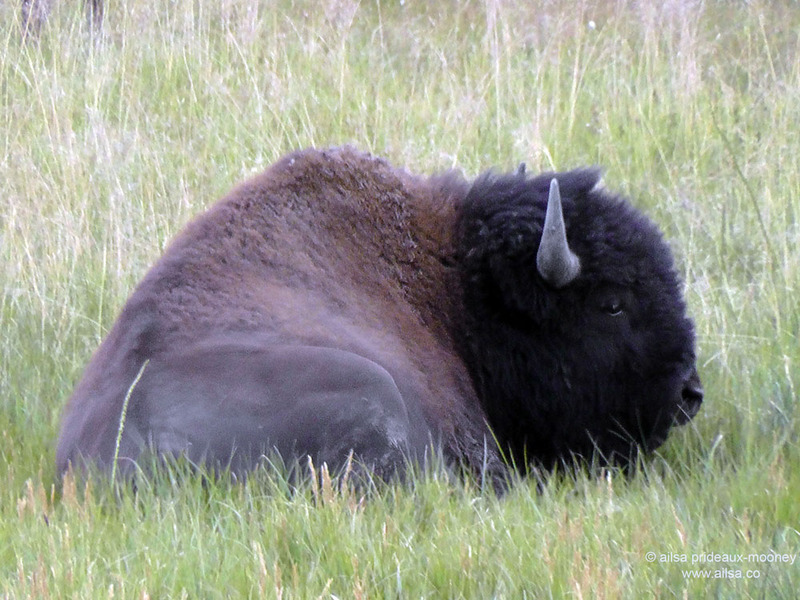 Haha, thanks Charlene, glad we made it in one piece, and it was thrilling to see those gorgeous animals in Yellowstone. I must go back there again. Wonderful pictures and words as usual! I’ll be in Yellowstone with my brother a week from today. Driving over from Billiings on Sunday, spending the night in the Park, and coming back on Monday by way of Red Lodge. Can’t wait! Love your blog! ‘Go neirí an bóthar leat’ (old Irish saying – ‘May the road rise up to meet you’, (usually said to wish someone a pleasant journey). Stay safe and can’t wait to hear about your next adventure! What a great story! I am glad you made it safely and took some great photos. To hell and back with a great tale to tell and wonderful photos to share. Easy to say now that it’s over, huh? Great post. I love reading of your adventures. We get the same thing here in NH when it comes to moose. The tourists are really just plain stupid when it comes to wildlife. The thing that gets me more than a little PO’d is that it’s the animal that pays the price for defending/protecting itself if they decide the person is too close. That was all I could think about while photographing the bears I’m sure are somewhere on my blog. I did my best to keep a safe distance no matter how much I wanted to get closer. Having the mother bear shot because I “had” to get a photo is something I wouldn’t want to live with. I saw those photos, Jeff, they were ace! Totally agree with you, how awful to have a bear shot – mind you, it wouldn’t be something you’d have to live with – if you got that close to a bear you’d be lunch! Wonderful adventure with Sprocket, and I really enjoy the video at the end of each segment. Wow, that sounds like quite an adventure, Far Side Travel! Yellowstone is pretty amazing, isn’t it? oh yeah, Yellow stone is pretty amazing, never went to Yosemite though! Your story is well written , can’t wait to read more of your wonderful blog! I cannot imagine traversing the Beartooth Mountain Pass in the dark! I had a flash of recognition with your situation because my husband and I experienced our own adventure in that stretch of highway. It is recounted in my travel memoir, Cliff and Me and the Motorcycle Makes Three. I am looking forward to reading more travel stories from you. 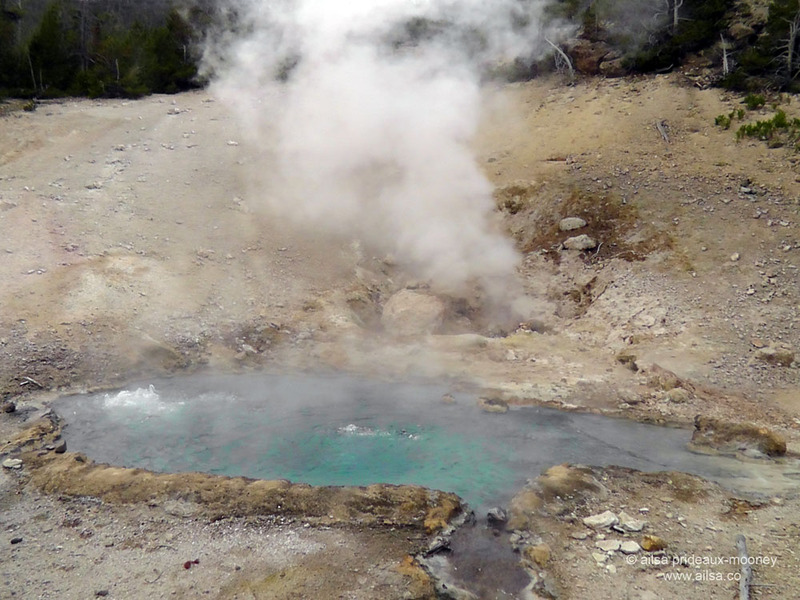 Yellowstone – best damn place on the planet! I’ve been to a lot of places and Yellowstone never ceases to amaze me. I’m glad you got to visit, even if it was a quick trip. My favorite direction to enter the park – seems like there’s almost more interesting characters there than just about anywhere else. Nice elk portrait! opps…meant Beartooth! We would joke it was really the Saber Tooth Tiger pass since it was so frightening. Boy, I wish we had driven it during daylight hours, Patti. I’ve seen some photos of the views and they are spectacular. Next time!